About the NAFA Website About the "Flyball Dogs in the Spotlight"
The NAFA home page regularly changes the featured cover dog to showcase the many faces of flyball. Thank you to all the photographers for letting us use your great photos. If you have a photo you would like to submit for consideration, please send it to the NAFA Webmaster. Include a brief bio of the dog, and who the photo should be credited to (please make sure you have permission from the photographer to use the photo). 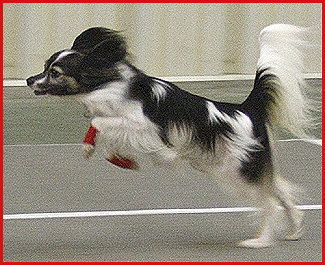 Papillon Wildfire Man In Black, known as Mickey, earned his Onyx in May racing with Florida Flash Flyball. Owner Pat Mann has raced him since May 2006 -- he has been a valuable height dog for Multi and Open teams. Mickey asked to learn flyball while he sat ringside with Pat and watched the action, barking nonstop the whole time. Pat gave him a chance to play and he has excelled in the game. Mickey has also titled in various agility venues and is starting competitive obedience training. AKA Wheatridge's Road Runner FGDCH 50k, OA,OAJ,JC. Beep-Beep joined the Gochman household 7 yrs ago and has been torturing the other dogs ever since. She doesn�t have the typical Ridgeback concern of making mistakes and not wanting to repeat exercises. 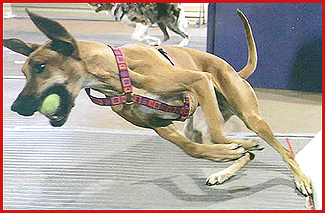 It�s these traits that I think helped her become a successful flyball dog that is also a Rhodesian Ridgeback. She is the first Ridgeback to earn the titles FDCH-G through FGDCH 50k and her fastest time is 4.2. While she does enjoy flyball her favorite activities are: knocking people down and jumping on tables. 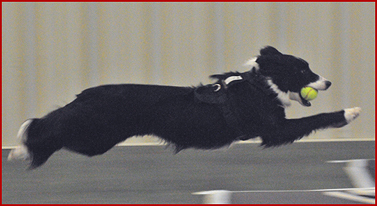 In 1997 Tab made his debut onto the flyball lanes and found his niche. 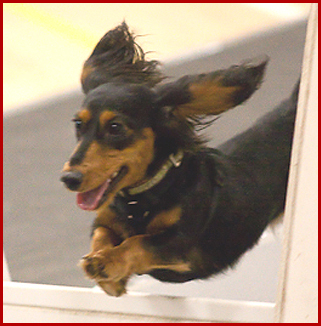 He loved flyball and soon became one of the core height dogs on the 4 Dog Night Flyball team. He became the 1st PWC to get the 20k, 30k, 40, and 50k flyball titles in the North American Flyball Association. After 10 years of racing, he ended his racing career as the #1 PWC (he is now the #2 PWC) in the sport. 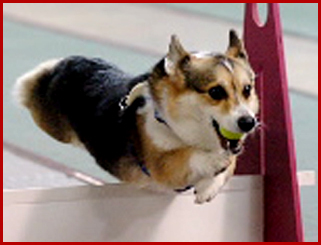 In 2005 he was voted region 15's MVP and in 2007 he was the only corgi ever nominated for the North American Flyball Hall of Fame. Very suddenly and unexpectedly Tab, aka Just enough Midnight Motion, went to the Rainbow Bridge on February 28th, 2010 one week shy of his 15h birthday. He is greatly missed by those who loved him. Photo taken by Sam Bennett of Swift-Bennet Photography (www.swiftbennett.com). From Shelly Pruitt: "'Super Cooper' is one of the shortest crowd pleasers in Region 9 and 15. He is 3 years old, has been playing flyball for 2 years and just received his FMX this past February. At 8in tall, Cooper gives it 110% always striving to beat that 6 second personal best, and coming closer every tournament. Cooper loves running, racing, and beating the dog in the other lane. He is currently ranked the #2 mini-long-haired dachshund. He loves to run back for food, and often sneaks an extra snack behind my back. Every time he runs, his ears fly out to give him a little extra lift over those jumps. When Cooper isn't playing flyball, he enjoys swimming, lure coursing, and snuggling." From Randy Garvin: "This is Bonnie. We are proud members of the Tampa Bay Barkaneers. Bonnie is my darling rescued from the Polk County Animal Services where she was found tied out in the middle of a field and abandoned. I rescued her on February 26, 2008, we believe her age to be around 4. She is only 17.75 inches tall and weighs in at 29.5 lbs. Her first Tournament was September 2009 and she currently is FM. Her CRN is 090734. The picture was taken in Orlando at our last Tournament in August 2010 by Kelley Benham-French. I think she is quite a bonnie lass, I hope you do also." Every flyball club wants a dream team and F.A.M.E. is no exception. 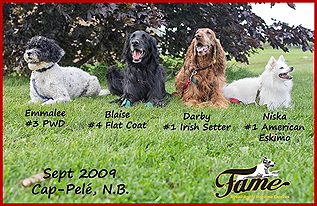 Our multi-breed team reached the dream in September 2009 with 2 dogs reaching #1 in breed, 1 dog reaching #3 and 1 dog reaching #4 of breed. Niska, an American Eskimo, was the first to reach 30,000 points for her breed and still running consistently. Darby, an Irish Setter, was the first dog to reach 30,000 points in her breed and recently reached 40,000 points and going for 50,000 soon. Emmalee, a Portugese Water Dog, reached 13, 530 points and after a brief reprise, is starting to run again. Blaise, a Flat-Coated Retreiver, reached #4 for his breed and recently retired. In addition to the achievement of reaching these levels, the team ran many times without a flag. In one day, the team reached the highest number of points possible for 6 races. We sure filled the bill for being a multi-breed dream team. Photo by Jules Comeau, (Kaleanophoto).